Borders, policing, and deportations are among the cruel ways the prison industrial complex dehumanizes communities. We stand against recent ICE home raids and in support of migrant rights as a crucial component of our fight for abolition. On Monday, January 4th, Department of Homeland Security Secretary Jeh C. Johnson confirmed the agency’s weekend sweep where 121 individuals, many of them children, were raided at their homes and imprisoned pending deportation proceedings. The government focused their weekend efforts on raiding and apprehending Central American refugees who entered two years ago and have been issued final orders of removal. While mainstream media stirred hysteria and even a xenophobic backlash, very little coverage looked at root causes and complexity behind migration from Central American countries to the United States. Central American migration to the United States is not a new phenomenon, but rather recent waves of migration can be traced back to the 1970s during U.S. meddling in Nicaragua’s and later El Salvador’s civil wars. 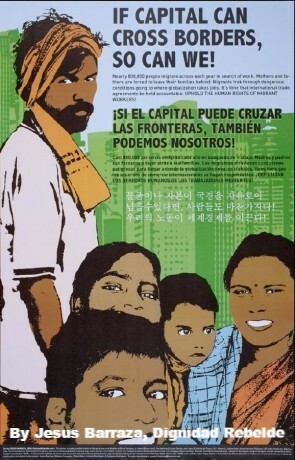 Most recently, the Central American Free-Trade Agreement and the expansion of capitalist exploitation in rural areas of the region, including southern Mexico, have forced many out of their countries. Dire economic conditions coupled with the region’s violence and police impunity put many in binding situations. The country’s narrow refugee laws, together with hyper border militarization and harsh immigration policies, do not properly capture the complexities that impel migration and the long historical linkages between Central American Countries and the United States, where people once freely migrated. The individuals targeted over the weekend were primarily from Georgia, Texas, and North Carolina, but home raids and these kinds of homeland operations are not new. In all, U.S. immigration operations have deported over 3.7 million people in the last decade using a decentralized network of local law enforcement agency collaborations, from parole offices that help identify people who have come in contact with the penal system to county sheriffs’ offices that contract out their jail beds to Immigration and Customs Enforcement. These are the same agencies and tactics that routinely terrorize urban, mostly Black, communities through federal and local programs such as gang injunctions, Operation Ceasefire, zero tolerance policing, and three strikes sentencing. The US government’s immigration policies have especially targeted people who have criminal convictions. As a tactic, home raids have been indiscriminately used by local level police authorities. At the federal level, they have become a lot more common among immigration authorities who are digging up 10 and 15 year old convictions of people who have been living in the country sometimes for decades. Home raids can be traumatizing experiences for people being imprisoned and their families, when officers bang on their doors during early morning hours and use diversion interrogation tactics in order enter people’s homes without formal court warrants. As global pressure mounts to address the current refugee crisis in South West Asia and North Africa, the US government is sending a clear message with raids targeting Central American refugees that the country will not tolerate more than its already restrictive migration, nor will the US be accountable for the harms caused by its economic and militaristic endeavors. Border militarization and control of movement by US Customs and Immigration Services are tools of state violence. 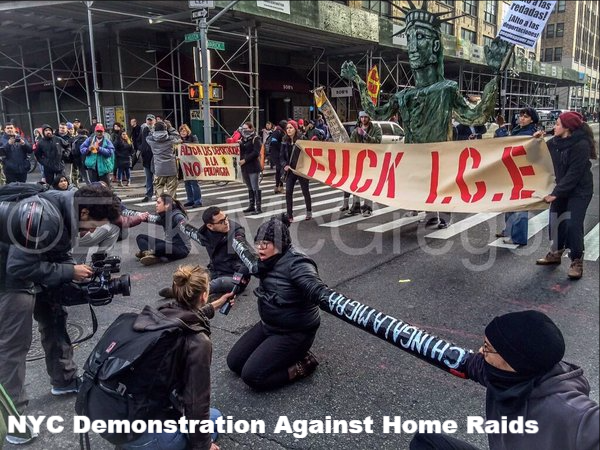 Communities continue to resist this anti-migrant state violence and in the last week have held demonstrations across the country, with more upcoming to protest against home raids, immigrant imprisonment, and deportations. Organizations are also mobilizing to educate people of our basic rights and provide immigration support. Bangladeshi refugees, who have been targeted and imprisoned by immigration officials for their political connections in Bangladesh, were on hunger strike throughout the South and speaking out for an end to migrant imprisonment and for just immigration policies. In a beautiful display of cross movement building, prisoners in California’s Yuba County Jail joined this strike to build connections between the imprisonment of migrants and the imprisonment of millions of people who are criminalized inside the US. Borders, policing, and deportations are among the cruel ways the prison industrial complex dehumanizes communities. We stand against the recent home raids and in support of migrant rights as a crucial component of our fight for abolition.